Whiskers, writers and State of Decay (1980) | Randomwhoness: a Doctor Who blog by Johnny Spandrell. Sampling stories in random order. State of Decay, Season 18’s tale of long lost spaceships and even longer lost vampires, is a collision between two contrasting views of Doctor Who. On the one hand, there’s script editor Christopher H Bidmead and his attempts to bring some scientific rationality to the series and erase the undergraduate frivolity of the previous season. It’s from him we get the pocket universes, the forgotten data banks and a society in technological stagnation. On the other hand, there’s writer and former script editor Terrance Dicks, master of 4 and 6 part structures, who knows exactly where to put the monsters, the jokes and the helpless assistants. It’s no wonder the two didn’t get on. At this stage Dicks had written or edited about 40 Doctor Who scripts and Bidmead had edited one. Goodness knows how the conversations about the script went down. BIDMEAD: Terrance, I think there should be a scene here where we investigate the system file structures of the computer’s operating system and discover a theoretical universe inside the negative universe of e-space. DICKS: Chris, that’s BORING! I think this is where Romana is tied to a post screaming while the vampires menace her! Cue cliffhanger, you see! DICKS: You know, it’s about this point in the story that the Master usually turns up. BIDMEAD: The Master? As if! DICKS: That’s it. From now on I talk to Barry and no one else! Still, something intriguing comes out of the creative marriage between these two men with very different ideas about what makes Doctor Who tick. Originally devised for season 15, we can guess at what State of Decay would have been like if Dicks had had his way; traditional gothic horror, set in England perhaps in an old manor house. Small number of people isolated from the outside world. Music by Dudley Simpson. Horror of Fanged Teeth perhaps. But I wonder which of them is responsible for the ingenious plot ending. I’m talking about when the castle, which turns out to be a spaceship, has a small scout ship which can serve as the mighty bolt of steel needed to kill the awakening giant vampire (we’ll politely ignore the fact that the ship is conveniently spike shaped, that it lands in exactly the right spot, that its somehow penetrates the ground to reach the underground cavern…). The story’s very setting turns out to hold the solution to the problem, which is neat storytelling I think. Because it involves technology coming to save the day you may think this was a Bidmead conceit. Except that Dicks pulled the very same trick in Horror of Fang Rock, where the lighthouse itself turned out to be the story problem solver. Something scientifically implausible about a diamond being placed in front of the lighthouse lamp to produce a laser beam. God knows what Bidmead would have thought of that. Meanwhile, Tom and Lalla are in love. You can tell by the way they’re so grumpy with each other. And then so sweet with each other. And then grumpy again. And so on. It must have been a very confusing time. One moment Tom’s vehemently refusing to help his lady love down off a ladder. The next he’s beaming at her with that voracious smile of his as if to say, oh it’s all a bit of a joke, isn’t it? Lalla wisely seems to maintain a cool reserve throughout, not getting too excited as if to guard herself against Tom’s unpredictable changes of mood. There’s one scene in particular where they both let their guards down and let the affection for each other shine through the TV set. It’s in Part Three, when it’s time, as Uncle Terrance would know, to indulge in a little plot exposition. Our heroes are locked in a dungeon so they have some time to kill. Tom and Lalla have done this scene before, lots of times. They know all its variations. And so rather than play it with the breathless earnestness of “we’ve got to get out of here before it’s too late” etc., they decide to play it like avant garde theatre, both facing away from each other, lost in their own dream worlds. So the Doctor tells the story of the Time Lords’ battle with the giant vampires and in return, Romana talks about an old job she once had working in an archive (do Time Lords work? Did she get flex time and penalty rates?). She casually mentions that an old book which might help them defeat the vampires was installed on certain time vehicles. ROMANA: (feigning disinterest) Oh, I don’t know. I forget. ROMANA: Type Forty, I think. DOCTOR: Psst. The TARDIS is a Type Forty! 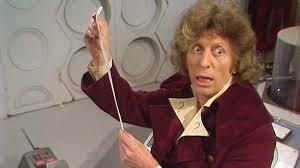 ROMANA: (feigning surprise) Is it? Oh. Lalla in turn is utterly delighted. ROMANA: Me? Wonderful? I suppose I am. I’ve never really thought about it. And then Tom punches a guard and the story rolls on. But just for a moment, we were let in on a beautiful romance, happening right in front of us. The planet of State of Decay has no name so let’s give it one. I nominate Whiskeron because of the popularity of unconvincing beards. They are everywhere. From village head man Ivo (Clinton Greyn; long, straight and grey) to vampire king Zargo (William Lindsay; teased into fetching curlicues). Silver surfer Kalmar’s (Arthur Hewlett) face is shaved, but he makes up for it with a strange assortment of plaits lying half heartedly across his pate. It’s a perplexing look for an old fella. Well, for anyone. But most peculiar of all is the strange brushy beard on feisty rebel Tarak (played by the terrifically named Thane Bettany) which seems to radiate in all directions. Perhaps feeling a little foolish under that unconvincing number, Bettany chooses to play every line with wide eyed intensity. I’m not sure which is my favourite. Is it… “The wasting is… the wasting! !” Or is it “I was a guard once…(turn directly to camera, beard faithfully following) I can be so again!“? Surely that’s Uncle Terrance again, pointing out that it’s now the part of the story when minor characters become cannon fodder. LINK to Planet of the Ood. Both are stories of an oppressed people revolting. One men over monsters, one monsters over men. NEXT TIME… KKLAK! We find ourselves in the golden age of Invasion of the Dinosaurs.